17-Aug-2018 -- This is the second out of 5 reports reaching confluence points in France along the 49th latitude during my 3-day bicycle trip. The story continues from 49°N 1°W. 3 km before reaching this confluence, I came through the town Saint-Pierre-sur-Dives. Leaving the town in south-eastern direction, road D40 takes you to a distance of 100 m to the confluence point. I walked straight to the point over a mown meadow. 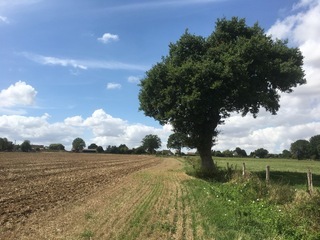 The confluence is then right at the edge of a second field within the vicinity of an oak tree. The village Les Cinq Frères which is 600 m north of the point can be seen. Coming back from the confluence visit, I squeezed myself through a barbed wire fence. I managed to scale it, but missed that there was a deep ditch on the other side of the fence. Unexpectedly I fell back salto down into the ditch onto my spine. I was scared but not hurt due to the soft ground. Vegetation: mown grass, bare field, oak tree. The story continues at 49°N 1°E.